After several successful web projects together, the team at Scenario Learning was ready to partner with us again to launch a new website for their flagship solution, SafeSchools. School safety is more complicated today than it has ever been. 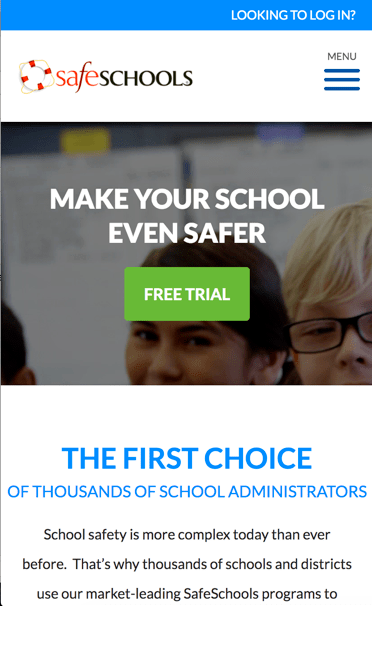 The award-winning SafeSchools K12 safety and compliance solutions help administrators protect schools and prevent safety incidents before they happen. We’re excited to see this redesigned site increase the number of free trials and skyrocket the business. “We’re now working on our fourth website in two years, and we recently just added SEO and Google AdWords, and we’re seeing tremendous results.” -Donna McMullin, Vice President of Marketing, Scenario Learning. The site prominently displays in multiple places the four different products SafeSchools offers. This makes it easy for administrators to navigate to product landing pages and easily read or watch a video about the features and benefits of each solution. Signing up for a free trial is the prominent call to action throughout the site. However, if someone isn't quite ready to take that step, they can use our calculator to determine what the annual savings to their district would be with the training system. Potential customers can browse the entire course library available in the Staff Training System. With an abundance of both the national and state courses, we organized the list into categories and made it easy to move from one to the next.